Collaboration is probably the only activity that everyone in every company engages in every day. Whether a CEO or new hire, an accountant or a construction worker, everyone needs to share and manage information, ideas, resources, and connections to get their jobs done. Until recently, most small and medium businesses (SMBs) could get along just fine by pulling together a few point solutions such as email, calendars, document sharing, and the good old telephone. But as the number of mobile and remote workers soar, requirements to collaborate with external partners, customers and suppliers intensify, and the information overload continues to mount you are not alone if you’re finding that tools are no longer up to the job. In fact, you are likely to be feeling that this hodge-podge of point solutions is leading to miscommunication and mistakes, which in turn, results in lost productivity and a loss of credibility with clients, partners and suppliers. First, the good news if this is your situation: there are more integrated collaboration suites available than ever before. In addition, many of these are geared to SMB requirements, and offered in an online software-as-a-service (SaaS) model—which takes cost, complexity and risk out of deploying and using these solutions. The bad news is that there are so many of these, it can be extremely difficult to figure out which solution will be the best fit for your needs. Because effective collaboration is so essential for any organization, and so many SMBs are searching for more integrated and streamlined collaboration tools, the SMB Group recently conducted in-depth study, Moving Beyond Email: The Era of SMB Online Collaboration Suites, to compare eight online collaboration suite vendors, including Google Apps for Business, HyperOffice, IBM LotusLive, Microsoft BPOS, OnePlace, Salesforce Chatter, VMWare Zimbra, and Zoho Business. Each of these vendors puts its own spin on the almost universally accepted benefits of the SaaS model including low up-front costs, anywhere, anytime, access, rapid deployment, ease-of-use, and more responsive support. HyperOffice focuses exclusively on SMB requirements. Integration enables users to continue to use legacy email, but in more convenient and powerful ways. It offers strong document management functionality, and features Hyperslide, which lets users create a virtual drive on their PC or Mac so they can manage, view and work on files stored on the web in HyperOffice as easily desktop files. IBM LotusLive integrates strong social media capabilities with traditional document management and collaboration tools. Users can invite “guests” that don’t have a LotusLive account to participate in specific activities and projects, making the suite particularly well-suited to companies that frequently have projects that include external consultants and contractors as team members. Microsoft BPOS emphasizes the benefits of the familiar Outlook and Windows look and feel in an online offering, and includes web conferencing as part of the standard service. Salesforce Chatter features a social media orientation with a Facebook-like interface, and tight integration with Salesforce CRM so that application updates are automatically posted into feeds. The SMB Readiness Grid (Figure 1) indicates our ranking of each vendor’s positioning in the SMB market, which we calculated from detailed vendor rating criteria and ratings that are included in the report. 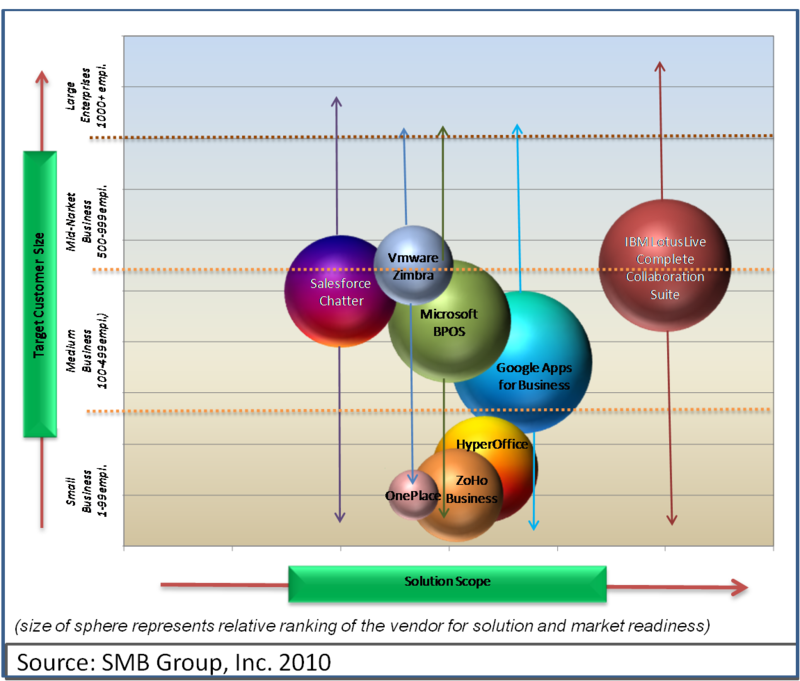 The sphere’s position on the X-axis represents the scope of solution functionality and breadth of products; while it’s position on the Y-axis represents our view of the “sweet spot” customer size segment for the solution. As indicated on the chart, today’s online collaboration suites provide SMBs with many powerful and affordable options to choose from. But, while all of the online collaboration suites we examined offer customers the benefits of a more streamlined and integrated collaboration approach, each vendor has a different view on what core functionality needs to be included in its offering, and in which areas they should invest to create additional value for SMB customers. This means that SMBs need to assess their own internal requirements and objectives first—and then explore the options that most closely fit their needs. In my next post on this topic, I’ll discuss some of the warning signs that indicate a business has outgrown point collaboration solutions, and discuss the key considerations that SMBs should be thinking about as they go through this process. In the meantime, if you are part of an SMB company that is actively considering whether to deploy an online collaboration suite, click on this link and I’ll send you a complementary copy of the study. Previous Previous post: What is Mobile Commerce, and Why Should You Care? What about some of the other offerings that compliment email based systems such as Yammer and Socialcast? Our group until now has been relying on the Yahoo Groups email broadcast method of communicating. That worked well until you reach the 500 to 750 emails per month level. Then we found that inbox overload set in. We are presently standardizing around Socialcast primarily because we found their mobile/non-web browser applications (iPhone, desktop) to be a little easier to use. With these solutions we like that we can create some specialized groups – for example a group that focusses on sales and one that focussed on technical. Those who want to follow the groups join — those that don’t can omit membership. Then as we communicate instead of sending out every email to every member — the “stream” of news filters only to those who are members of groups that they’re interested in. For now both the Socialcast and Yammer solutions are low (about$36/user per year) or no cost. The downside to both these solutions is that while they offer free entry level accounts (which we’re using) there’s a nagging feeling that the “free party train” cannot go on forever and at some point the service will all have to charge or adopt a different business model.